Press was the fourth pillar of democracy and for a strong and vibrant democracy it was imperativeto have a free and fearless press. 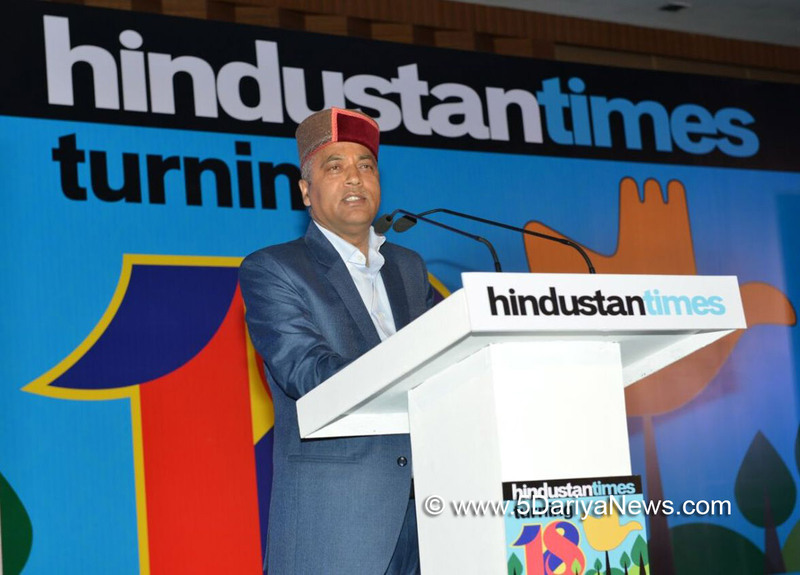 The Chief Minister Shri Jai Ram Thakur stated this while addressing the gathering at Chandigarh today on the occasion of 18th Anniversary celebrations of Hindustan Times.Shri Jai Ram Thakur said that the Hindustan Times during 18 years of existence of its Chandigarh edition had created a special place in the hearts of the readers in the region. He said that the paper due to its fearless and fair reporting has emerged as a role model of professionalism.The Chief Minister said that the media should give greater coverage to development reporting particularly the rural issues. He said that the Hindustan Times has provided a platform for the three neighbouring states to ponder over the issues of mutual interest.The Chief Minister said that the Hindustan times was established in 1924 and during all these years it has emerged at the epitome of fair and free journalism. He said that the Chandigarh edition has reached adulthood and with this the responsibilities have also increased manifold. He said that to survive in the present era of cut throat competition the Hindustan Times has not only survived but has pioneered in many fields.Shri Jai Ram Thakur also announces Rs. 5 lakh for Press Club Chandigarh.Editor Hindustan Times Shri Ramesh Vinayak presented vote of thanks.Governor Punjab Shri VP Singh Badnor, Chief Minister Haryana Shri Manohar Lal Khattar, Chief Minister Punjab Capt. Amrinder Singh, former Chief Minister Punjab Shri Prakash Singh Badal and Managing Editor Hindustan Times Ms. Somaya Bhatacharya were present on the occasion among others.